In Object-oriented philosophy, whenever an object is perceived, a new object is created. These "interpretation objects" are built from perceptions and memories, so all experiences have a distinctly anachronistic quality ~ the persistence of this anachronism may induce a peculiar affect associated with the familiarity of novelty. "Two guarded feathers" and “Ж, 2019” belongs to a series of paintings that do not represent subjects optically, but instead the depict a subject’s “interpretation objects” . The distant object is a maximally inclusive and collective conception of being rendered nostalgically (hence individualistically). Like dream objects, these images depict a reorientation of the usual associations between objects and their meaning. An image asking: What is the line that separates and connects a voice from its environment ? 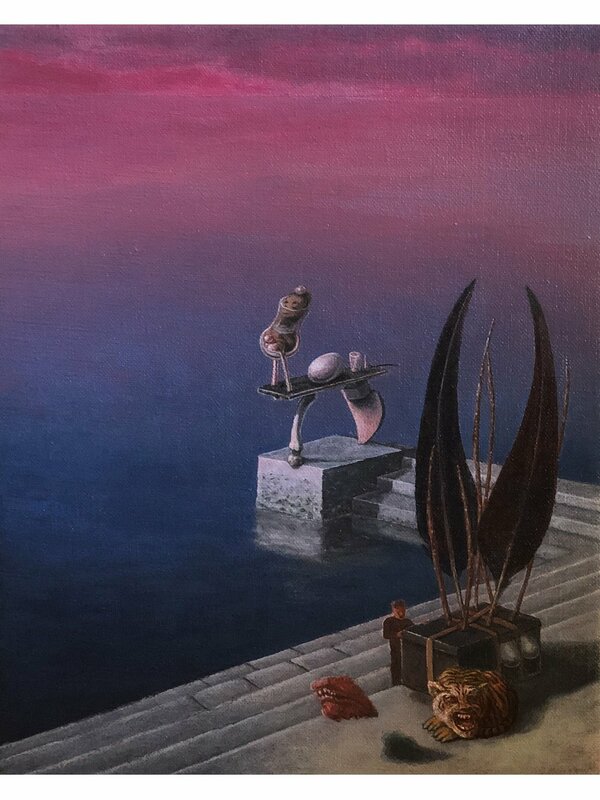 UNLIKELY ROMANTIC CATALAN SCENE is a transitional painting, and return to dream-oriented, unconsciously figured, inspirationally motivated, Surrealism. Drawn in a Catalan cafe over 5 days, then painted with great intensity in two sessions three years apart. It depicts an unconscious multi-generational romantic idealisation as four people framed by awkward architecture and strong public sculpture.